We have begun a challenging journey toward achieving healthy and thriving people, communities and world. Thrive! is the overall vision, mission and strategy for thriving. HealthePeople is the vision, mission and strategy for health and well-being. To achieve healthy people and a healthy and thriving future, “HealthePeople - Building a Healthy and Thriving Future” offers an integrated strategy for you, your communities and our world. 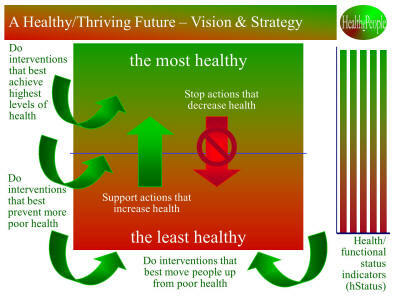 This strategy was created with the belief that we can help reach the vision of healthy people and a healthy and thriving future via a strategy of high performance health systems for all that are self-perpetuating, affordable, accessible, person-centered, “e” enabled, prevention-oriented, and producing high health quality, outcomes and status. Such systems, partly physical and partly virtual and put into place by collaborative private and public partnerships, will greatly improve accessibility, quality, affordability and health status for all people. To positively change that future and achieve healthy people, “HealthePeople - Building a Healthy and Thriving Future” combines the best of all strategies to achieve healthy people and achieve a healthy and thriving future for you, your communities, your country, and our world. America needs effective transformation as we spend over 1/6th (about $3 trillion) of our economy on health without producing a healthy America or a healthy people. We are on a challenging journey toward reforming the American health system and improving America's health. America enacted substantial health care reform in 2010 that is a major improvement, especially for un- and underinsured. Unfortunately, there is much needed health reform that the law could have addressed better and ensure the health of all Americans. To positively change that future and achieve healthy people, “HealthePeople - Building a Healthy and Thriving Future” offers an integrated strategy and effective reform that would result in an accessible, affordable and high quality American health system. Combining the best of all our strategies, we can achieve healthy people and achieve a healthy and thriving future for America. New Thought Piece: Thriving Health System© is available as free download from this website. HealthePeople book is available via Amazon.com or as free download from this website. Thrive!® is a vast, sustained human endeavor coupled with a vision, mission and call for action. It strives to energize and empower a vast endeavor of people together building and sustaining a thriving future, including you, your communities, and our world. It envisions, calls for and strives to achieve a thriving future for all forever. Its mission is to help create and sustain positive change to help build communities and a world that not only survive but thrive. Thrive! Endeavor® is to have people of all backgrounds and generations join together in this endeavor. It strives to motivate governments, private sector organizations and people to seek a thriving future and to work together to build and sustain that future. GChris abstract sculptures, created by Gary "Chris" Christopherson, are what is termed "thrive sculpture" and are heavily mission-driven. Advanced by the art are core progressive values - reducing human vulnerability, maximizing human potential, saving our environment, and building a thriving future. Existing GChris sculptures number over 200 with dimensions ranging from a few inches to 12 feet and larger. Chris wrote four science fiction books - The Thrive! Endeavor, Extinction - The Failure To Thrive, Thrive! - Escape From Extinction, and black box. Stories of unknown technologies, science, religion, politics with the human pursuit of positive personal and global change and a thriving future or all forever. He wrote two children's books - T!rrific [terrific] - What will you do to thrive? and Angel, Thriving Creator of Artful Things. All are available at GChris.com and Amazon.com.